This Thing Called Life! : Love you-Flyin High!! Happy Weekend!! I hope you all are having a great day! 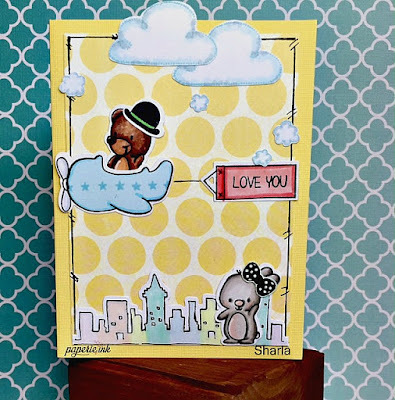 I'm up today on the Paperie Ink blog with this card. I've used all the images from the Flyin' High stamp set, aren't these images so cute!! I just love the different images, accessory stamps and clean cutting matching dies! The bigger clouds were from a single stamp from my stash. I've colored all the images with copics and kept to a softer color scheme this time, I just love the little airplane and how cute with the banner....there are several words that fit in the banner and would be perfect for all occasions, the cityscape is cute too and look at the hat and bow on the bear and bunny....oh my goodness, the cuteness is too much! Please head over and check out the inspiration on the Paperie Ink blog, have a great day! !